Happy New Year everyone! I hope your first week in the new year has taken off on a positive new start already! Even if not, you still have *51* more weeks to make 2012 a promising and productive year for yourself. Granted, this is not to encourage you to procrastinate =) but to remind us that we have many chances in life to make our lives positive for ourselves and for those around us. If you haven’t seen my last post, you still have time to enter in my Lunar New Year Giveaway. Prizes total $100 and THREE (3) lucky winners will be selected for special gift cards just in time for Chinese New Year. Also, I will feature special recipes in the coming weeks to help you welcome in the Dragon Year. So come back often for festive Chinese New Year recipes you can make at home! And if you participated in my $50 Amazon Gift Card Giveaway over the holidays, the winner is announced on the giveaway post, as well as on my Facebook and Twitter pages. Congratulations to the winner! 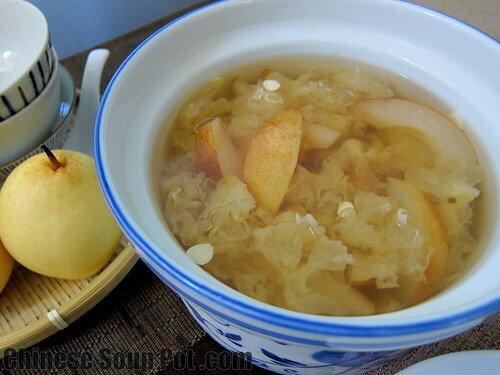 For my recipe today, I decided to make a Double Steamed Asian Pear and Almond Dessert Soup. This (and the Snow Fungus Papaya Almond Milk Dessert, 雪耳木瓜鮮奶糖水) has always been one of my favorite dessertssince childhood. And it is surprisingly easy to make. This dessert soup has just the perfect flavor profile of a classic double steamed Chinese dessert. It has a delicate sweetness that is nicely contrasted with a smooth gingery zing that sits over a lovely mellow tone of almond fragrance and fresh pears. 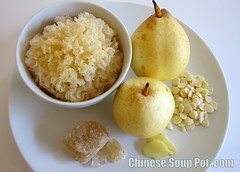 Its sweetness derives from the rock cane sugar and Ya Li Chinese pears. The gingery kick of course comes from the small amount of ginger used in my recipe. And the wonderful aromatic hint of almond flavor in this dessert comes from the bitter and sweet almonds (also called North and South Chinese Almonds) which are really the inner kernel of an apricot seed. This dessert can be enjoyed hot or cold. And as you will find out after making my recipe, the hot version of this dessert brings out the gingery zing more while the cold version of this very same dessert highlights the fragrant almond flavor profile. So this dessert soup gives you a ying-yang flavor depending on the temperature it is served in. On a cold day though, I always prefer a hot bowl of this dessert soup to bring warmth and a satisfying comfort in my stomach. On a hot summer day, a cold version of this light dessert is both refreshing and soothing. 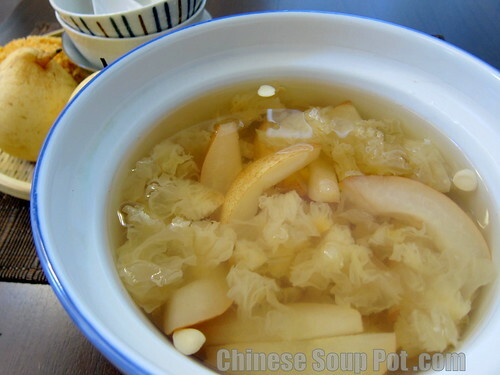 Besides tasting great, this double steamed gingery sweet soup is also very healthy. It is low in calories, low fat, low in cholesterol, vegetarian and vegan friendly. What other delicious dessert can you think of that can beat this ultra combination of benefits? Seriously. 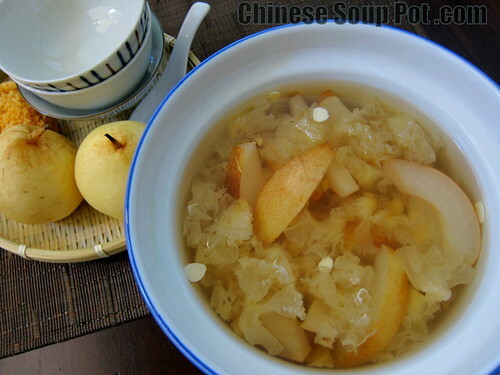 And from a Traditional Chinese Medicine perspective, this dessert soup is known to serve important health functions that is especially applicable in the cold dry autumn and winter seasons. 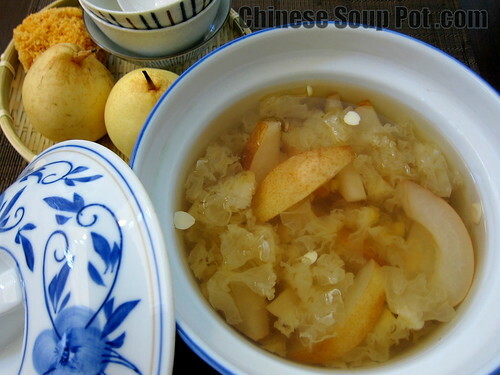 This dessert soup nourishes and moisturizes the lungs and skin. It helps to quench thirst if your throat and mouth are constantly dry. 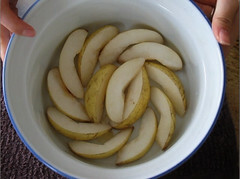 Asian pears are also known in Chinese Medicine to relieve dry coughs and help expel phlegm. I hope you will make this recipe and enjoy it your family! 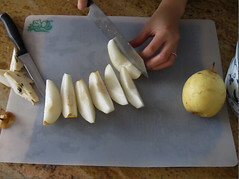 Wash, core, and quarter each ya li Asian pear lengthwise. Cut each quarter slice in half again. Line pear slices on the bottom of a porcelain double steamer. 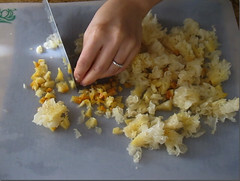 Cut the soaked snow fungus to small pieces. If the center is hard, dice it to small pieces so they can cook and soften during the cooking process. Spread them over the pears in the double steamer. 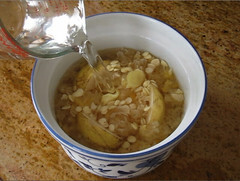 Wash, drain, and sprinkle the bitter and sweet almonds over the snow fungus in the double steamer. Add the ginger slices and rock sugar on top. 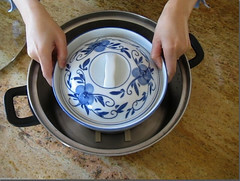 Add 4 cups of water into the double steamer and cover with the double steamer lid. Optional: Seal the top of the double steamer with a plastic food wrap (e.g. saran wrap). This is to prevent steaming water from splattering in later on. 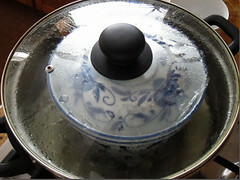 Place a metal steam rack or a pair of chopsticks at the bottom of a large stainless steel pot. The pot must be big enough to fit the porcelain double steamer inside. Place the double steamer inside the stainless steel pot. 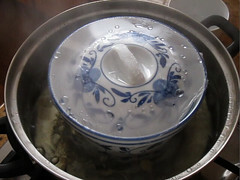 Add enough water so that it comes up to about 50 - 60% of the height of the double steamer. Place the stainless steel pot over high heat until the steaming water boils. Reduce the heat to Low and simmer for 2 hours. When done, remove the plastic food wrap and serve. Yum! I love Chinese dessert soup! I’ve never tried one with pear though. It’s very light and perfect for me trying to lose weight…. love snow fungus. Texture is amazing although my kids are not into it yet. Thanks for the recipe! This recipe sounds even more unusual than the previous one (and the first one I saw on your blog). I would have never even dreamt of a dish combining mushroom and almonds and pear and being sweet! The south and north almonds are a huge discovery too. Thank you for sharing and Happy New Year! Wow! This looks beautiful–I can just imagine how good it tastes, especially with the ginger. I love your step-by-step photos in the recipe too! I love this delicate flavored soup, of course served warm for me, as I am feeling very yin today. 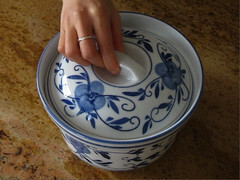 Your Chinese blue soup pot is beautiful and makes your photos pop! Xin Nian Kuai le! Oh my, this looks so delicious! I love Asian pear and almonds, but I’ve never had either in a soup. The double steamer really intrigues me, I’d love to play around with one. An unusual dessert – looks so naturally sweet. Bet the flavor lingers. Happy new year! Aww, this looks wonderful! And it also seems so outlandish to me! I only know puddings, cremes, bakes etc for dessert, but not soups! Dessert soup sounds so wonderful. YUM! So so lovely. Mu MIL is a big fan of this! Now I can make it for her. A soup for dessert! That is so unusual over here!! But yes yes, I very much love the thought of having a soup for dessert! And this looks so delicious and also healthy! Also, I’m a big friend of soups, particularly in autumn which just occurs over here! I know that apricot kernels have a very endearing, almond-like taste … I only know that from cookies made from apricot kernels, though. Making soups with them sounds really interesting!